While the civilizations of the Mediterranean and Middle East developed in contact with each other, Indian and Chinese civilizations grew up quite independently. Great geographical barriers separated them from other civilizations, allowing India and China to develop their own rich, unique cultures and traditions. As Harappan civilization declined in the Indus Valley, around 1750 B.C. bands of nomadic pastoralists began to migrate into India through the Hindu Kush Mountains from the Iranian Plateau and Central Asia. Herding cattle and horses, and farming wherever the terrain was suitable, these migrant pastoralists called themselves "Aryans." They were a branch of the Indo-European-speaking peoples migrating into Southwest Asia and Europe about the same time. Modem scholars usually refer to them as "Indo-Aryans" to distinguish them from those Aryans who remained in Iran. Indo-Aryan religion. Most of what we know about these early Indo-Aryans comes through their religious texts, the Vedas. The Vedas were hymns to the gods in which the people expressed their ideal conceptions of religion and society. The Vedas were originally an oral tradition. The oldest, the Rig-Veda, or "Verses of Knowledge," is a collection of more than 1,000 ancient hymns used in rituals and sacrifices. Although it had probably been compiled by 1000 B.C., the Rig-Veda was not written down until about A.D. 1300. The Indo-Aryans worshipped many gods, whom they associated with the forces of nature. Two of the most important were Indra, god of storm and war, and Varuna, who was associated with the sky. The Indo-Aryans worshipped the gods in a complex ritual based on the sacrifice of food items and animals. As they intermingled with the earlier Indian peoples, the Indo-Aryans also began to blend older Indian gods and traditions with their own. The Brahmin was his mouth, of both his arms was the [Kshatriya] made. His thighs became the Vaisya, from his feet the Sudra was produced. . . . Indra [the chief god] and Agni [god of fire] from his mouth were born, and Vayu [the wind] from his breath. Political structure of northern India. By the 600s B.C. the Ganges Valley had become the center of Indian civilization. The Indo-Aryans had learned to cultivate rice, allowing increased food production and thus a rapidly expanding population. With growing numbers to support larger armies, many kingdoms gradually developed on the flat plains. At the head of each state was a raja, or king, usually a member of the Kshatriya. According to the Rig-Veda, "the king abides prosperous in his own abode. The earth bears fruit for him at all seasons. His subjects willingly pay homage to him." The kings lived in palaces and wore brilliant clothes that set them apart from others. In addition, the Rig-Veda also indicates that the kings had councils composed of noblemen, who were also Kshatriyas. Southern India. Far less is known about devel­opments in southern India. Archaeological evi­dence suggests that development in the southern regions was much slower than in the Indus and Ganges Valleys. People in the south learned met­alworking later, and while the north united into large kingdoms, the south remained fragmented. Nevertheless, the south was also affected by the spread of Sanskrit and Indo-European ideas. Thus, the peoples of the south also eventually identified themselves as Brahmins, Kshatriyas, Vaisyas, and Sudras. One reason that the south developed later was its difficult geography. The jungle-clad Vindhya Mountains cut off the southern part of the Indian peninsula, called the Deccan, from the technological advances of the north. In addition, much of the terrain in the Deccan is hilly, which made consolidating territory more difficult than in the flat plains of the north. A major consequence of this comparative isolation by land, however, was that many peoples of the south turned to the sea. Through coastal ports, they eventually established important trade contacts with other regions around the Indian Ocean and in Southeast Asia. Like the rest of Eurasia, people in China too felt the impact of the new war technologies developed first by the Indo-Europeans further west. From about 4000 B.C., people in China had practiced agriculture in the valley of the Huang He. Farmers used stone tools and lived in small villages in isolated clearings along the river valley. In the second millennium, however, chariot-driving invaders dominated the farming populations of the Huang He valley. These invaders were a tribe called the Shang. Although it is unlikely that Indo-European groups themselves actually migrated so far east, the technology of their war chariots probably passed from one group of people to another across the Eurasian steppes. Probably in western China, the Shang became the latest to adopt the new warfare techniques and use it to take control of a river valley population. Shang government. Sometime between 1750 and 1500 B.C., the Shang established their rule over the Huang He region. They established the first historically verifiable dynasty in China. Under the Shang, China developed a complex bureaucracy to rule its expanding empire. At the center of this bureaucracy was the king, a member of the Tzu clan. The king, who was believed to be a descendant of the gods, was the supreme military leader, commanding the armies against neighboring peoples. At its height, the Shang Empire stretched over 40,000 square miles, about the size of Kentucky. Tsu Chia...refused to be king unrighteously, and was at first one of the lower people. When he came to the throne, he ... was able to exercise a protecting kindness toward their masses. He did not dare to treat with contempt wifeless men and widows. Thus it was that he enjoyed the throne thirty and three years. However, the ruler had to produce results, and rebellions broke out when he failed. Poor crops or defeat in battle meant the ruler no longer had the support of the gods and had lost his right to rule. In these towns lived specialized workers, such as wood carvers, leatherworkers, and stonecutters. Sometime during the Shang dynasty, artisans learned to raise silkworms, to spin thread from their cocoons, and to weave silk cloth from the thread. The bronze castings of Shang artisans are widely regarded as outstanding works of art. The technique of casting may have spread to China from the Middle East, possibly Sumer, though some scholars argue that it developed independently in China itself. 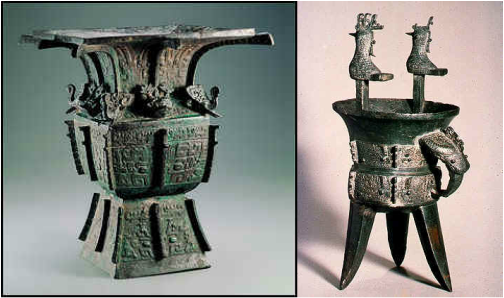 Clearly, however, the forms of the Shang vessels and the designs of the decorations were uniquely Chinese. Chinese artisans cast small figures as well as large ceremonial vessels whose surfaces featured delicate embellishments. Shang religion. The religion that developed during the Shang dynasty combined ancestor worship and animism, or the belief that all things in nature had a spirit. The Chinese worshipped the gods of the wind, earth, sun, moon, and clouds. However, the most important god was Ti, who had the power to provide abundant harvests or victories in battle. The Chinese also believed that the way to influence Ti was through the king’s ancestors. The king communicated with his ancestors through diviners, or priests. The diviners made incisions on tortoise shells or cattle bones, called oracle bones, which they heated over a fire. They used the pattern of cracks that appeared to interpret the answers. Diviners consulted the oracle bones during ritual sacrifices, requests for good weather, or for interpretation of events such as dreams, illness, or death. Development of writing. The style of writing that developed during the Shang period is remarkably similar to Chinese writing today. Instead of using a phonetic system of writing, the Chinese assigned a special symbol, or character, to every word in their language. At first these characters were pictograms, or drawings of objects. As the language became more complex, the Chinese developed ideographs, which conveyed ideas rather than pictures. As the language developed, these characters modified somewhat, but they are still similar enough that an untrained reader can understand many ancient Chinese symbols. Unlike the Indo-Aryans, the early Chinese used writing to compose and preserve literary works. Writing itself became an art, called calligraphy. Characters were written with a brush in lines that ran from the top to the bottom of a page, beginning on the right side. Because the art of calligraphy was so difficult to learn, great calligraphic skills were considered to be evidence of a good education. Fall of the Shang dynasty. The Shang kingdom collapsed in the early 1100s B.C., apparently because the last Shang king, Ti Hsin, exhausted his kingdom’s strength in wars against nomads to the north and east. He failed to guard the frontier where the Zhou (joh) were rebelling. Led by Wu Wang, the Zhou formed an alliance with several nearby tribes and invaded the Shang kingdom. King Ti Hsin killed himself, and Wu Wang seized control of the Shang capital. The Zhou believed that the gods determined who should rule China, a right known as the Mandate of Heaven. When the Zhou conquered the Shang, they called themselves the Sons of Heaven, because the Mandate of Heaven had passed from the Shang to the Zhou. The Zhou political order. After the last Shang king was overthrown, the Zhou campaigned for years to consolidate power. Rebellions by the remaining Shang and their allies drove the Zhou to create a new system for preserving order. Many scholars refer to this system as a kind of feudalism, by which they generally mean a decentralized power structure characterized by bonds of individual loyalty between rulers and their nobles, and the nobles and their warriors. In Zhou China as in Shang China, the king owned all of the land in China. In the Zhou feudal order, however, the king gave the right to control land in strategic locations to his kinsmen, who became lords. They built fortified cities to use as bases from which to conquer the outlying lands in the name of the king. Because the king and his lords were related, the bonds between them were stronger than if their relationship had been solely based on duty and obligation. Over time, however, these lords became quite powerful, as local people looked to them as their protectors. As the lords grew stronger, the power of the king diminished. Zhou society was divided into classes. At the top was the king and the royal family, which included most of the hereditary feudal lords. Aristocratic warriors supported the lords, and together they ruled over the masses of peasants and slaves that made up the majority of the Chinese population. The feudal system provided the stability that kept Zhou China relatively at peace for about two centuries. The Zhou expanded their borders both northward and southward, fighting against non-Zhou peoples and nomads. The Zhou eventually controlled an area much larger than the Shang kingdom. Decline of the Zhou dynasty. However, by the 800s B.C., Zhou power began to disintegrate. The feudal lords grew less loyal to the king, and invading nomads chipped away at Zhou strongholds. A popular uprising drove out the tenth Zhou king in 841 B.C., and a period of disruption began. The greatest threat to the Zhou kingdom came in 771 B.C. According to tradition, King Yu had a new consort named Pao-Ssu that he wanted to please. To make her laugh, he raised an alarm by lighting signal fires and sounding a big drum. When the feudal lords hurried to defend the king, they found no enemy, merely Pao-Ssu and King Yu laughing. Later, when barbarians really did attack the royal capital, King Yu again raised the alarm - but the feudal lords did not respond. King Yu was killed, Pao-Ssu was captured, and the Zhou dynasty in the west came to an end. King Yu’s son fled eastward to establish what became known as the Eastern Zhou dynasty. The period before 771 B.C. became known as the Western Zhou dynasty. The kings of the Eastern Zhou, however, were never able to attain any real political or military power. Instead, local nobles became the real powers in China, ruling their own territories virtually as independent, and increasingly rival, states. As China descended into greater and greater disunity, later Chinese historians looking back came to divide the history of the Eastern Zhou dynasty into two periods, the Spring and Autumn Period, which lasted until about 475 B.C., followed by the Era of Warring States.